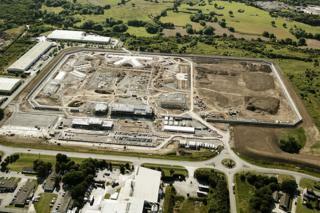 When it is fully operational, HMP Berwyn will be the largest jail in the UK. Ministers have promised this super-prison near Wrexham will provide a "huge boost" to the regional economy and it has been claimed this could be worth £23m a year. It is too early to assess whether and when that will be reached but already the development has made its mark. The construction, which got under way in April 2015, is a £212m investment. Contractors Lendlease made strong commitments to use local businesses. There was a promise £30m would be spent with local businesses, defined as within 50 miles - or an hour's drive. That covers an area stretching from Stoke on Trent, Liverpool, Llandudno and Newtown. There have been Meet the Buyer events trying to help the number of local suppliers and it has so far reached £36.6m, according to the developers. There has also been a target that £50m should be spent with small and medium sized businesses across the UK. That has been exceeded and stands at £80m. And of the 1,000 employed on site so far, 67% have been local. Wrexham Concrete Design is both a local and small business. This third generation family firm has a workforce of 22 with three people taken on because of the contract to build concrete floors for the prison. Managing director Paul Dunn said the tender process was hard at first but that Lendlease were very supportive. He said it was a once in a generation opportunity - and he was making sure the businesses he buys from were also local. "When we were given this job we made sure we gave [business] to other local people," he said. "It has helped grow our business and it's helped grow businesses that we have given the work to." Paul Dunn bought concrete worth £1m from another Wrexham firm Eco-Ready Mix, based just a few miles from the prison. It was set up in 2007 and doubled its workforce to 24 when it knew it would be supplying Wrexham Concrete Design with so much concrete. Eco-Ready Mix also spent more than £1m on new trucks and another £250,000 on a more modern concrete mixing system. The local supply chain goes even further. Eco-Ready Mix managing director Gary Billington said he bought all the cement, sand and stone for the work from north Wales businesses. Both companies have also found that securing and carrying out the work at the prison has helped the reputation of their companies. They have gained work from Clwyd Compounds and other local firms and have managed to retain the extra staff they took on initial for the prison contracts . At nearby Glyndwr University, staff and students have been watching developments. Dr Jan Green, senior lecturer at North Wales Business School, said: "There were predictions of 550 construction workers on site, and you can see the vast numbers of trade vans and I'm very happy that 44 young apprentices have been taken on." 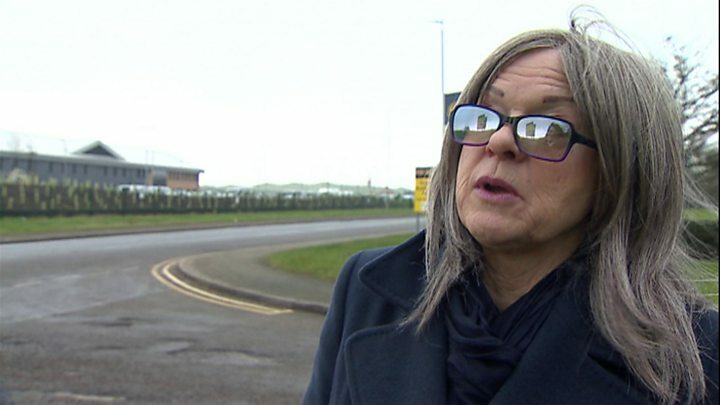 She also said Glyndwr University have been training some of the prison officers since August and that too has a positive effect on the local economy. But what about long term effects? Dr Green said: "It's like building a small town where people are staying and living. "We need food, we need healthcare, we need education and we need the supplies that are ongoing and it's difficult to identify quite who is going to get those contracts and that is where the economic benefit in terms of business is going to come from". It is too early to know how much extra money will be spent in north east Wales when the prison is working and HMP Berwyn is buying all those goods and services. Perhaps not surprisingly, the massive amounts of linen from 1,800 prisoners and staff will be cleaned at the prison's own laundry. More surprising is that the bread for inmates will be made there too. But David Hanson MP, former Prisons Minister, said one of the biggest impacts on the local economy will be the money spent by visitors on things like petrol, taxis, meals out and hotels. In Wrexham town centre Dot Crimes and her husband run the Dot to Dot cafe they opened in September. She is optimistic their cafe will be busier as people visiting prisoners some to the town. She sees the prison as an opportunity for the town. Mrs Crimes: "With all those prisoners, there are bound to be families coming through to see them, the railway station is at the end of the town centre, they are going to be travelling through the town to get to the train and the bus station so it has got to benefit us hasn't it?" But so far it has been very difficult to find out where the prison will buy things like fruit and vegetables, meat and day to day supplies. Iwan Thomas, from the North Wales Ambition Board, has been working with Lendlease, local colleges and business to help expand job opportunities in north Wales. He argues that many people have had their first experience of work or increased their skills while the prison has been built. The challenge for Wales now is to make sure those people and skills can still work here on schemes like Wylfa Newydd and tidal power off Colwyn Bay. Super-prison: How does HMP Berwyn compare to others? What is going wrong with the prison system? 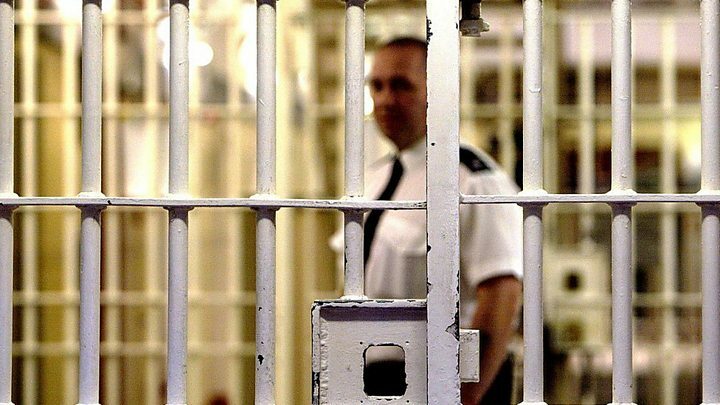 Reality Check: Do England and Wales lock up more people?